Ruffle stitch adapted from 450 Knitting Stitches – Volume 2 (Harmony Guides), Lacy Bubbles stitch. I highly recommend this series of stitch pattern books. This is one of my favorite stitches because it is has such a fun, lighthearted pattern. 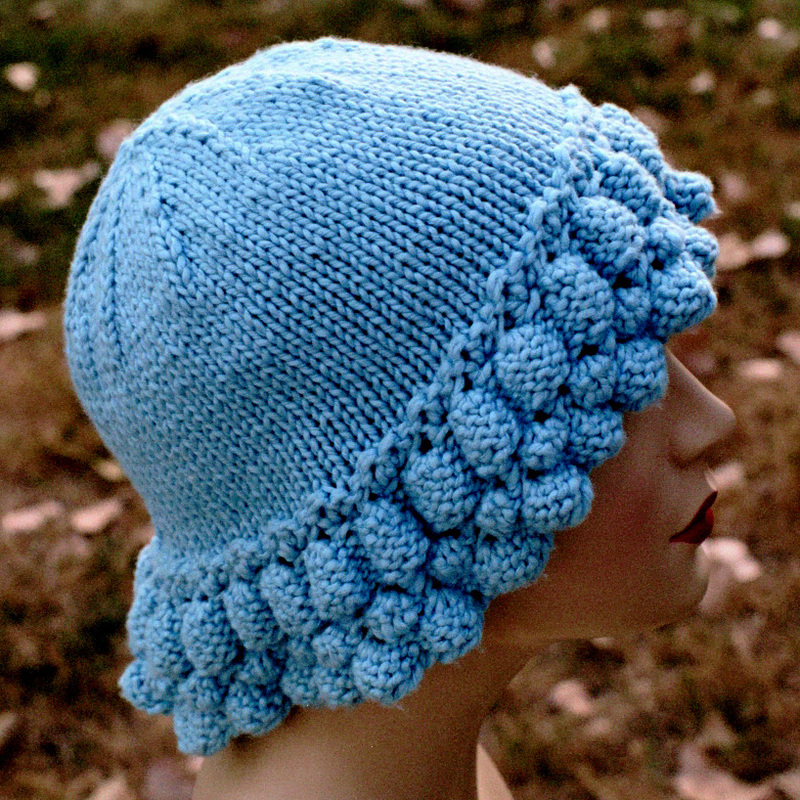 It was a challenge, however, to adapt the look to a circular hat pattern from a straight needle pattern. I discovered the trick was to work from the wrong side for the ruffle and then turn the work over to complete the hat from the right side. Yarn: 3 oz, 150 yards worsted weight. For a summer hat I recommend worsted weight cotton yarn. The yarn I used in the example has been discontinued. However, my favorite cotton yarn right now is Berroco Modern Cotton (available at Patternworks). Circular Needles, Size 9 US (5.5 mm), 16″ long. I love 16″ Addi Turbo Circular Knitting Needles (the best!) at Annie’s, but I also have found that knitting with bamboo circular needles work well with slippery cotton. Stitch markers. I prefer flat, soft stitch markers like Soft Stitch Ring Markers because they don’t break or get tangled up in the yarn. For different gauges, increase or decrease in multiples of six for ruffle pattern. You will need to adjust the hat decrease for your total number of stitches. Ruffle is worked from the wrong side. When ruffle is complete, turn work and knit from right side. Keep the tension LOOSE but consistent because you are going to have to purl 5 stitches together. Cast on 163 stitches. I recommend putting stitch markers every 18 stitches to help keep track of the pattern. Round 1: Slip first stitch. Knit to last stitch. Knit last stitch with slipped first stitch, being careful not to twist the row. This will close the round and decrease one stitch. 162 st. Place marker. Round 13 (decrease to end ruffle): k2tog to last st, sl last st. 81 st. Round 1: Slip stitch you just slipped at end of ruffle. Knit back over round just completed until last stitch. 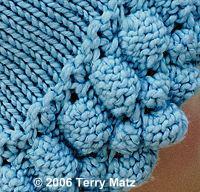 Knit last stitch with slipped stitch to close up hole caused by the switch in sides. 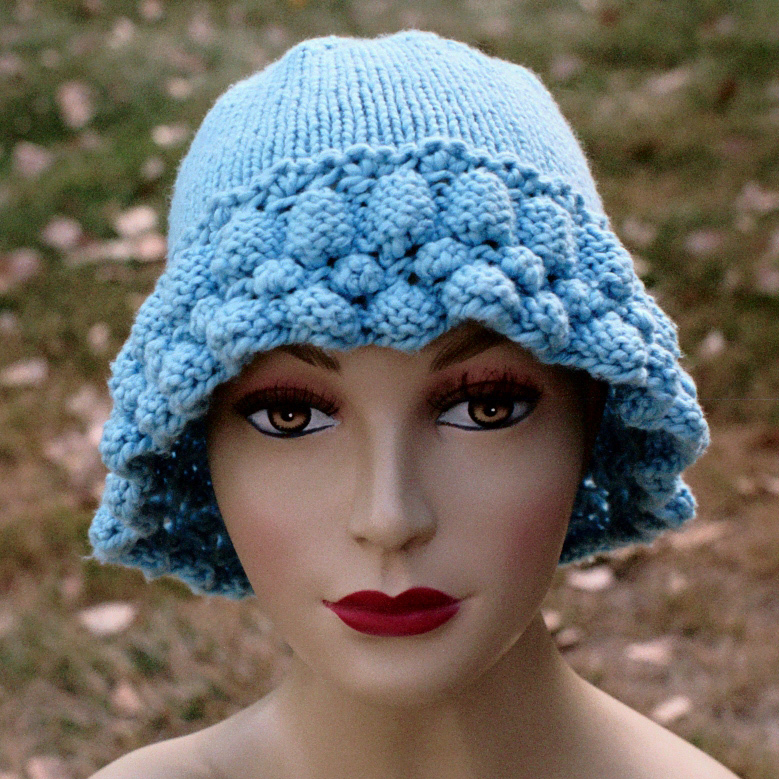 Knit until hat measures 6-7″ from the cast on edge. I suggest moving the stitch markers to every 10 stitches. This will help you track the decreases later. Switch to double pointed needles. I just knit off an equal number of stitches on to the double pointed neeedles on the first decrease round. Round 1: (k8, k2tog) around. 72 st. Round 2 and all even rows: Knit. Round 3: (k7, k2tog) around. 64 st. Round 5: (k6, k2tog) around. 56 st. Round 7: (k5, k2tog) around. 48 st. Round 9: (k4, k2tog) around. 40 st. Round 11: (k3, k2tog) around. 32 st. Round 13: (k2, k2tog) around. 24 st. Round 15: (k1, k2tog) around. 16 st. Round 17: k2 tog around. 8 st.
Cut the yarn leaving about 6″ tail. Using a tapestry needle, thread the tail through the remaining stitches. Pull stitches together tightly. Thread tail through hole in crown. Draw crown closed securely by pulling tail. Weave the tail and all other ends through stitches on wrong side. Finished measurements: Hat body about 20″ in circumference. 8-9″ from ruffle to crown.